If you’re new to growing cannabis or still in the beginning phases, trying to figure out the best nutrients for your cannabis plants can be very confusing. There are so many companies making and selling nutrients: each one creating multiple types of nutrients with different purposes. The most important thing is to make sure you give your marijuana plants the right amounts of nutrients at the right time. There are two main life stages for cannabis plants, vegetative growth & the flowering stage, each stage has different nutrient requirements. Why “K” for Potassium? The atomic symbol of Potassium is “K” from Neo-Latin kalium. In other words, you want to use a “Vegetative” (high Nitrogen) or “general purpose” nutrient formula for the first stage of life known as the vegetative stage. If using high-quality soil, you can skip vegetative nutrients for the first 3-4 weeks while your plant uses up the nutrients in the soil, otherwise you should start with vegetative nutrients around the time your plant opens its first leaves. 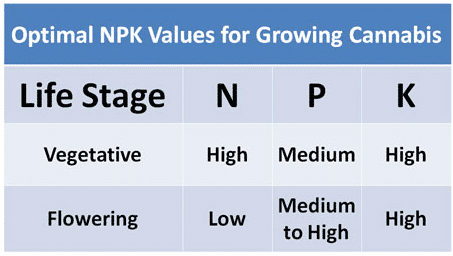 Use a “Bloom” (low Nitrogen) nutrient formula with plenty of P & K for the flowering stage. Start using bloom nutrients when buds start forming to make sure your plant gets plenty of Phosphorus & Potassium, which are crucial to bud development. Phosphorus tends to increase the number of flowers, while Potassium helps increase the bulk/weight of flowers. Be careful, though because going overboard with either one can burn your plants! The main thing is to avoid giving too much Nitrogen in the flowering stage, as it can discourage bud development in the flowering stage and add an unpleasant taste to buds, which is why a general purpose plant nutrient isn’t a good choice in the flowering stage. Cannabis Growers Secret: If you find yourself in an emergency need for nutrients: Nutrients made for “cactus” or “succulents” can be used in the cannabis flowering stage, because they usually have low amounts of N and plenty of P & K.
Note: Don’t use any type of time-released nutrients (like fertilizer spikes, or “slow release” Miracle-Gro soil) because they deliver too much N in the flowering stage and may reduce bud growth. Cannabis needs plenty of P & K to grow big buds in the flowering stage. Using the Best Cannabis Growing Nutrients is just the beginning! There are a few more things you need to know for optimal nutrient intake. Check the pH of your water to prevent deficiencies. It may surprise you that the most common reason growers get nutrient deficiencies is because the pH is too high or too low. This happens even if the right amounts of nutrients are present, because your weed simply cannot absorb the nutrients if the pH isn’t in the correct range. 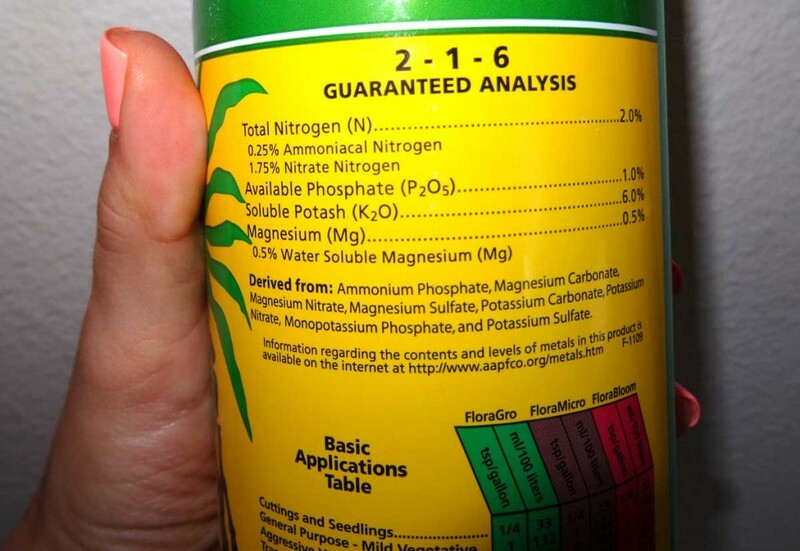 Optimum pH for cannabis plants.. Checking the pH will make a huge difference to your grow by keeping plants vibrant and healthy. It only takes a few minutes each time you water your plants! If you get a digital pH pen, it only takes seconds to test your pH! Learn more about pH & preventing nutrient deficiencies here!